Noise monitoring is an important component of any total environmental monitoring solution. Monitoring can also mitigate and significantly reduce the financial and non-financial risk associated with non-compliance to relevant standards and regulations. As part of a total environmental monitoring solution, noise monitoring must distinguish not only the level but also the origin of the noise. For regulatory purposes, knowing the origin is particularly important, so that noises from external sources (for example, wildlife) cannot be incorrectly attributed to a particular industrial or commercial activity. Depending on your project requirements, ECOTECH’s suite of 01dB smart noise and sound vibration analysers can be fully-integrated into a new or existing ECOTECH environmental monitoring station to create a cohesive multiparameter environmental monitoring system. The first sound level meter to offer completely wireless vibration measurement. Connect FUSION™ to a WLS wireless vibration sensor and it will record and store 3-axis vibrations in parallel, audio signals and all noise indicators. Designed as a noise terminal for permanent or semi-permanent monitoring. The CUBE™ has the functionality of the DUO™ and FUSION™ but with a remote microphone, external GPS and 3G antenna connection to allow use in more remote regions. All-in-one: FUSION™ and CUBE™ in a single instrument. 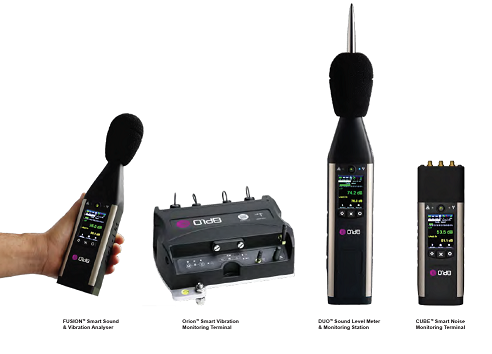 DUO™ is completely modular with a comprehensive range of features that lets you use it either as a sound level meter or a fully-fledged noise monitoring station. An all-in-one standalone vibration monitoring system with integrated sensor, 3G modem, WiFi and GPS. It is robust, waterproof, easy to configure and use. ORION™ also features seven measurement channels and smart integration of vibration standards. ECOTECH has over 40 years’ experience in the design, construction, installation, commissioning and maintenance of integrated environmental monitoring systems across Australia and around the world. Our solutions are designed to withstand the toughest environments, from tropical rainforests in Indonesia, to the frozen tundra of Antarctica, urban centres like New Delhi, to remote mining sites in Western Australia. With the addition of 01dB’s world-class noise monitoring instruments, our custom-designed systems are now even better equipped to meet the needs of ECOTECH customers worldwide. ECOTECH Noise Systems can be housed in a variety of different shelter types and sizes depending on location and project parameters. All-weather, temperature-controlled robust ECOTECH shelters are designed to withstand the extreme weather conditions when installed in harsh urban or remote locations. External microphones are fitted on weather masts and are designed to withstand the elements. With the CUBE™, external antennas allow communication in remote locations. The ability to mount the monitoring equipment in a range of enclosures – from existing monitoring shelters to standalone fibreglass, stainless steel or plastic enclosures – allows measurements in a range of conditions. Newman, Western Australia. 1200km north of Perth. ECOTECH designed, installed and maintains a network of hundreds of dust monitoring stations in and around Australia’s remote Pilbara region for a number of large mining companies. The network of monitoring stations ensures dust levels from mining and blasting activities meet stringent environmental regulations. In 2017, a mining company wanted to extend its monitoring parameters beyond dust to also include noise, so it commissioned ECOTECH to design a solution. ECOTECH retrofitted a 01dB CUBE™ smart noise monitoring terminal into an existing dust monitoring station located in Newman, creating a fully-integrated environmental noise monitoring system. Critical to the success of the project was the need for the noise monitoring system to accurately record, log, then push all noise data to the mining company’s proprietary online data capture system. Accurate, reliable data is an essential factor in the successful operation and management of monitoring systems. An entire network of monitoring stations can be controlled centrally for data analysis, comparison and reporting. Using ECOTECH and 01dB software, an ECOTECH Integrated Noise Monitoring System manages the entire data interface. Communication platforms include integrated WiFi and 3G with ability for third party 4G, satellite and radio module connectivity. Real-time and historical data can be presented through secure on-screen displays, SMS messaging or emails. Data can be made available to the public via custom-designed web pages. ECOTECH can also push data out to external FTP networks. This allows captured data to be directly available on in-house systems managed and operated by end-use customers. Optional weather sensors integrated in the one system. Our highly specialised team of ECOTECH field technicians and engineers use a unique problem-solving perspective and decades of combined environmental monitoring know-how to install integrated systems, ensure they operate successfully and meet all regulatory standards, including initial calibration and final checks. Once an ECOTECH Integrated Noise Monitoring System is installed and operational, scheduled ongoing maintenance and calibration of all monitoring instruments is critical to ensure maximum performance, reliability, accuracy and regulatory compliance. Accreditation is a valuable risk-management tool. ECOTECH is NATA-accredited for continuous monitoring of ambient air, meteorological monitoring, blast monitoring, calibration services as well as industrial emissions (CEMS) monitoring. ECOTECH field staff are equipped with ECOTECH’s own industry-leading Asset Management System (AMS) to manage site assets, test equipment and perform associated maintenance tasks in accordance with Australian Standards and NATA requirements. All maintenance and calibration activities are logged and tracked in AMS, facilitating collaboration between client and ECOTECH in performing calibration, operation and maintenance in accordance with NATA requirements. Our AMS system provides that additional level of traceability. ECOTECH’s NATA-accredited facilities and services comply with the requirements of ISO/IEC 17025 and include testing laboratories, calibration laboratory and blast monitoring services. Search for “ECOTECH” at www.nata.com.au/accredited-facility to see the complete list of ECOTECH NATA accreditations. The first, and only NATA-accredited 01dB noise and vibration Calibration, Service & Repair (CSR) centre in the world is located at the ECOTECH global head office in Melbourne, Australia. The 01dB CSR centre was established to meet the growing needs of 01dB customers across Australasia. The centre received its full NATA-certification as an ISO 17025 compliant laboratory in February 2019. The convenient Melbourne location significantly reduces lead times for the calibration, service and repair of 01dB instruments.